We have been suspiciously silent over here at Dolfans NYC and I figured I had to write an update of sorts. There has been so much Dolphins news of late it’s hard to keep up! I could talk to you for hours about the exciting new offensiveÂ acquisitionsÂ of Mike Wallace and Dustin Keller or the revamping of the linebackers or myÂ disappointmentÂ at losing both Jake Long and Sean Smith. But all that stuff has been covered to death. I could talk about our needs but I think it’s pretty obvious to everyone that we have big holes on the offensive line and in the secondary and if you guys are paying enough attention you know the names that are still out there in free agency (Winston & Grimes come to mind). I could talk about the draft but I watch about three college games a year and could bring nothing to the conversation.Â So what can I talk about? How about some Dolfans NYC business! We have some big things planned for the draft. We are going to do a huge meet up and roll to the draft in force. Last year we got on TV when Tannehill was picked and hopefully we can do it again this year. Show the Dolphins that they have love in Jets country. We will of course update the site when we have firm draft plans, but if you want to get notified about the draft send us an email at dolfansnyc@gmail.com and we will put you on our draft mailing list. We also might be trying to organize something with Mike Wallace for the weekend of the draft but we have to keep all the details top secret for now but if that’s something you would be interested in, email us about that as well. I also should probably say something about the new logo rumors. Everything I have heard from my source leads me to believe that this could in fact be the logo. I got two messages the day of the leak that lead me to believe the Dolphins are upset that it’s out there. I never thought our leaking what we thought was a draft of the Dolphins logo would turn into a big thing, but whatever the case I hope it doesn’t hurt any of the Dolphins plans. 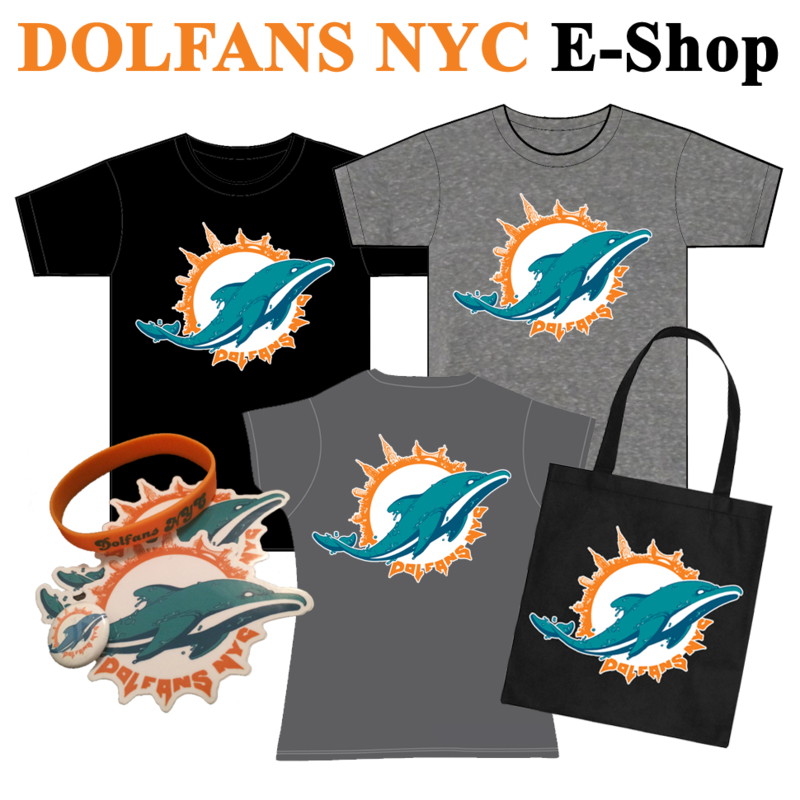 Speaking of the logo, we need to make new Dolfans NYC shirts and although I wanted them for the draft, I think we might have to wait until after. I want to do a new Dolfans NYC logo when the new logo comes out. That way people who have the old shirt might want to buy a new one with the new logo. Logo changes are all about selling merch and since we are always trying to raise more and more money for charity this seems like a perfectÂ opportunity. If anyone has any new ideas for raising money for charity let us know. We are always looking for new fundraising ideas. Raising money for the Miami Dolphins Foundation is not only a good cause, but it shows the Dolphins we are doing positive things and it makes them want to support us as a club. It’s a win win for everyone. Anyway, that’s it for now and I hope to update the site more often as we get ready for the draft! Go Dolphins!